Chiranjeevi-Ram Charan-Pawan Kalyan all remake Tamil blockbusters. Home/NEWS/Chiranjeevi-Ram Charan-Pawan Kalyan all remake Tamil blockbusters. 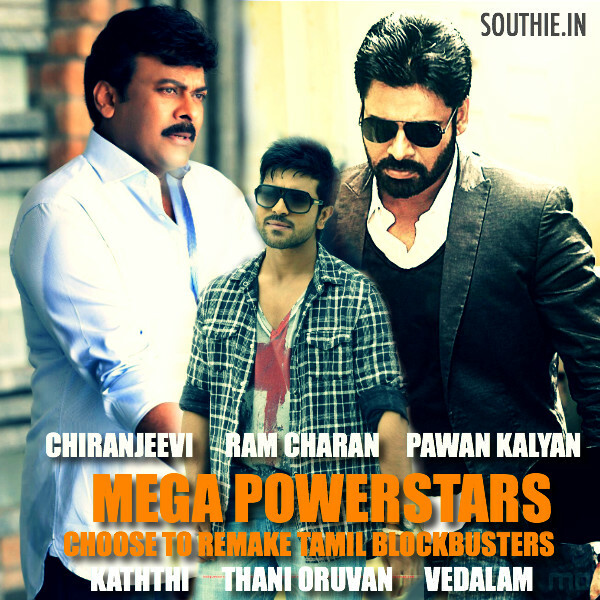 Chiranjeevi-Ram Charan-Pawan Kalyan all remake Tamil blockbusters. Most hyped movies are all remakes from the stars of the Mega Family. Chiranjeevi is making a comeback with Vijay’s blockbuster movie Kaththi and V V Vinayak is the Director of this movie. Ram Charan has chosen Thani Oruvan which has an intelligent script and strong script and Pawan Kalyan is in the news for Vedalam.